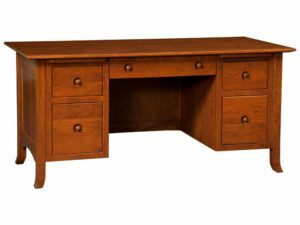 Small, stately and space-efficient, Amish Secretary Desk Furniture makes a practical and beautiful accent piece. So it’s perfect for your own reflective and productive spot in your bedroom, living room, dining room, den or home office. Also, we offer a wide variety to choose from. So you should find the wood secretary desk that’s just right for you. 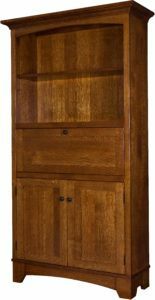 What’s more, Amish artisans custom-build each unit from solid hardwood, for incredible strength and durability. 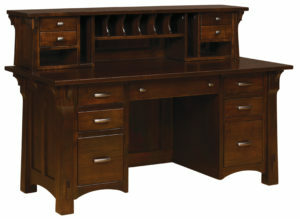 So browse our online selections of custom secretary desks. Or visit or ‘brick and mortar’ store in picturesque Shipshewana, Indiana. And check out which Amish made desk is right for you. Our Amish Secretary Desks feature the traditional design and classic construction that have marked these beautiful furnishings for generations. In each secretary desk, you’ll find dynamic storage space, including letter slots and space inside the full-extension drawers. So which custom secretary desk is right for you? Check out the Queen Anne Secretary Desk. It features a carved wood design, full-extension drawer and durable letter slots. 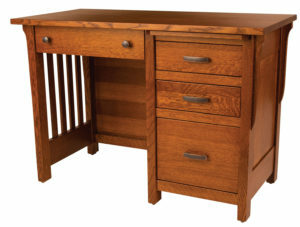 Also, the solid oak construction and rich wood finish ensure that this desk will last for decades to come. Then, you gotta look at the Shaker style desk. Whichever style you choose, you can create the secretary desk just the way you like it. Because you can choose features like the wood specie, finish, hardware and other options.